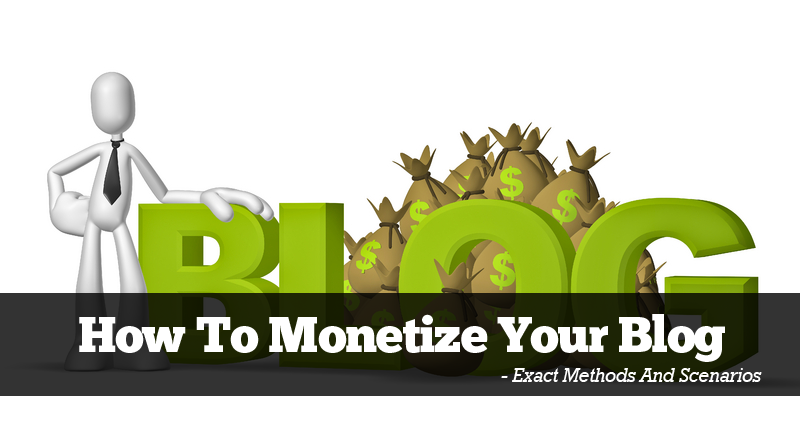 The topic of blog monetization becomes important to most bloggers at given points in their careers. Blogging as a hobby is great and you can do it your whole life, but if you want to start making some money on the side eventually (or maybe even full time income) then you have to get to know and understand some of the most popular ways of monetizing a blog. This post explains what some of the most popular monetization methods are and how to use them (from a technical point of view). What it doesn't explain, however, is how to actually make them work. You see, all these monetization methods are just tools and it's always up to you to make any actual money with them. Of course, there are hundreds of different blogs that claim they can teach you this, but no matter what they say, every niche is different and this is a major factor in the possibility of making money. Not only this, but your position in a given niche matters as well. A beginner in a niche can't usually make their money the same way a veteran (authority) can. In a nutshell: making money using various methods is a process that requires much trial and error, but it always starts with learning the tools and understanding how they work. There are basically two main paths of making money: the indirect approach, and the direct approach. The indirect approach is when you make money as a side effect of doing other stuff. Hence the name - making money indirectly. To make it clear let's just use some examples and talk about the most popular indirect ways of making money on a blog. This is probably the most popular and the most misunderstood indirect way of making money from a website. What's so indirect about it? This is a prime example. You're making money from advertising while people are reading your content (enjoying your site) and every once in a while they click on some ads. The idea is that you're not publishing content just to get someone to click, but they do it anyway whenever they see an interesting ad - this is how you make money indirectly as a side effect of publishing your regular content. There's nothing more obvious than advertising. Even when you talk to someone who's never owned a website and uses the internet only for Facebook, when you tell them that you're making money from your blog, the first thing they're going to say is: "Advertising?" Why is it the most misunderstood? Because most of the time it is not the best possible way of monetizing a website. Don't get me wrong, advertising works, like gangbusters, but only if your site is big enough. In essence, you need traffic before you can translate that traffic into money. OR. You need a truly niche audience - people interested in specific kinds of topics. In such a situation, the audience doesn't need to be huge. The basic rule of thumb is: the more general the topic of your site is, the more traffic you'll need to make advertising work for you. There are many ways of advertising. You can use traditional graphic banners, text links, sidebar banners and links, contextual ads (e.g. AdSense), etc. This is essentially advertising, but I think that it deserves a separate coverage. When doing traditional advertising, you generally get paid when someone clicks your ads. Affiliate marketing is different. It won't get you paid right away. To earn money as an affiliate, you have to convince someone to click your ads and THEN buy the thing you're promoting, or perform some other desired action. Apart from that, it's essentially the same. You're still using banners, text ads and all kinds of other things. Direct ways are a lot easier to grasp and more intuitive for more experienced website owners. Basically, it's everything you do on your site/blog with the pure intention of making money from it. Let's just start with some examples to get this explained nicely. This is probably the most obvious direct path you can take. Offering their own products is the biggest money maker for many bloggers out there, including most of the A-list team. The product development topic is a really extensive one, and there are tons of great tutorials and information online, so I'm not going to pretend that I can explain it in this one post. However, the main idea (and I mean the most basic idea) of this whole thing is somewhat simple. You start by doing market research to find out what is most likely to be bought by your audience. Then you come up with a product, spend some time on developing it, create marketing materials, set a launch date and off you go. Once you have all of this done you can start promoting your product on your blog or website. Each post where you talk about your product openly is a direct try at making money. Depending on the niche you're in and your position in it, the product approach may or may not work for you. But as I said in the beginning, I'm only describing the tools and it's your job to make things happen. The technical aspect is still the same as it is for indirect affiliate marketing. You still get a custom link (provided by the affiliate network) and when someone clicks it and makes a purchase you get a commission. But the difference is how you're using it here. Reviews. You write a review for some product you're an affiliate of, and publish it on your blog. If your audience finds the product interesting they can click your link and buy it. However, be careful not to write a fake review just to get someone to buy the thing. This isn't worth it. If you want to write a review you need to make it honest. Recommendations. Those are usually just short posts describing a new product that has just been launched. A product you find interesting for your audience... A kind of "hey, check it out"-post. Interviews. The idea is that you interview someone who has just launched a new product you're an affiliate of. You talk about the topic of the product or whatever else you want, and at the end you take that opportunity to present your audience with your affiliate link and try to sell them on the product. Themed landing pages. This is a somewhat complicated thing. You start by creating a custom landing page around a certain topic (keyword). The page should contain valuable information real people might be searching for. Finally, you top it off with some affiliate links. I'm sure there are more ways of doing some direct affiliate promotions but let's just stick with these for now. In a nutshell, if you want to make money through affiliate marketing, you should include some of this affiliate-content in your overall content plan. Some of the most popular freelancing fields are: writing, web design, online marketing tasks, consulting, or whatever makes sense in your niche. However, you need to be careful when taking part in this. Some audiences are okay with those kinds of posts, but some can get enraged and publish some angry comments if they see an "evil paid post." Anyway, you won't find that out until you actually publish something like this, so it's your call. This concludes both the indirect approach and the direct approach. As I said earlier, feel free to comment if you're using other interesting ways of making money from your blog. I'm curious to know. There are never too many good ideas for making money, right? Karol K. is a 20-something year old freelance blogger and writer from Poland. Check out newInternetOrder.com and get his advice on freelancing and starting an online business. Some nice article you have here. Have tried indirect affiliate without much success. The Yahoo Ads are giving m e nothing either.